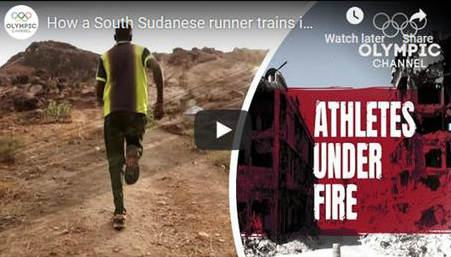 Watch: How a South Sudanese runner trains in the middle of a Civil War by clicking here or the play button on the image below. Today, Santino is attending Cloud Community College in Kansas, running on the school’s track team and working on his associates degree in nursing. He is currently running the 1500 meters in 3:40, which is just 1 second shy of qualifying for the 2020 Olympic team for South Sudan. If you would like to send Santino a note of encouragement you can do so by clicking the button below and emailing him a message that will be shared with him.